Excuse Me, Cat Coming Through! 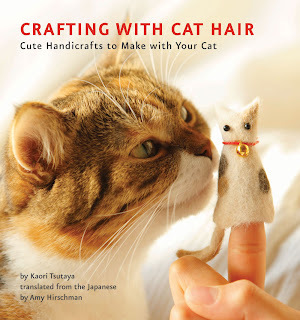 Cute Giveaway: Crafting With Cat Hair Book! 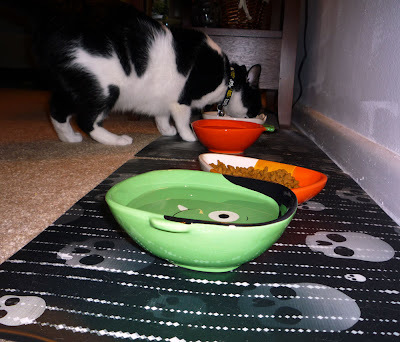 Two Cats Tuesday: Our New Halloween Bowls! Santa Paws Drive: My Favorite Project Ever! I know sometimes I eat so much that all I want to do after is take a nap. But I don't think I've ever actually fallen asleep while I was eating too much! Noms are delicious. But they can also be exhausting. Where the cat wants to go, the cat will go... and no dog is going to stand in her way! This pretty kitty wants to go out her cat door, but her fluffy puppy brother is lying right in the way. No problem, though. She'll just climb right over! Oskar is a five-month-old blind kitty. He was born without formed eyeballs, but he doesn't even know he's missing them. He bravely takes on a hair dryer in this epic battle, and as you can see, he is just as silly as any kitty can be! Seriously, I am in love with Oskar. This video makes me smile so much. He has no idea what a hair dryer looks like, but he is out to get that air... wherever it is. He's not scared of it... he's just having fun and attacking like any regular cat would do. If you have kitties, you surely have some extra cat hair lying around... Probably a lot of extra cat hair. Normally you'd vacuum or lint-brush it, right? Not anymore! Cat hair is the latest crazy in arts and crafts, and Cute is giving you a chance to win a copy of the book "Crafting With Cat Hair: Cute Handicrafts to Make With Your Cat!" This fun book shows readers how to transform stray clumps of fur into soft and adorable handicrafts. Originally published in Japan in 2009 and featuring 9 distinct projects—from kitty tote bags and finger puppets to fluffy cat toys, picture frames, and more—this charming book is perfect for any cat lover, crafter or crafter who loves cats! Sounds kind of fun and silly, doesn't it? My favorite is the finger puppets -- I can't wait to make little puppets of Pimp and Moo! To enter to win a copy of Crafting With Cat Hair, just leave a comment below and tell us what color fur your kitty (or kitties!) have. You can leave a comment for each cat! We have 5 copies to give away, so there will be lots of winners! Comment entries must be posted by Tuesday, October 18. I'll randomly pick 5 winners using random.org and announce the winners after that. Good luck and happy crafting, kitty lovers! UPDATE: This giveaway is now closed. Thanks to everyone for entering! Want more giveaways and cute videos everyday? 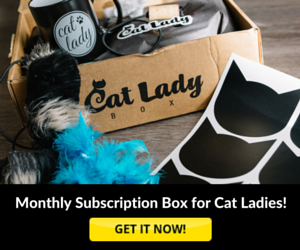 Why not subscribe to Your Daily Cute by email? We'd love to have you as part of our family! Happy Two Cats Tuesday, Cuteheads! We always get excited around holidays around here, especially Halloween. I'm a big dork when it comes to holidays. I love to decorate, and Pimp and Moo get in on the action, too! Today Moo wants to show you their festive bowls and placemats! 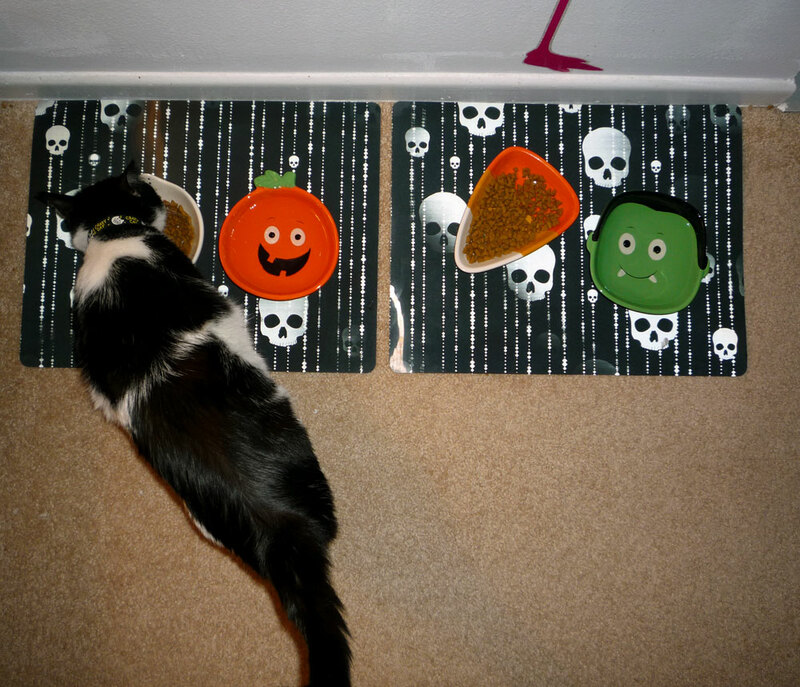 These are our new spooky bowls! I am not afraid to eat out of them. Nothing can spook me away from noms! 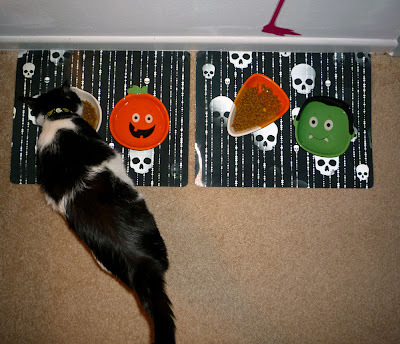 And look how scary our placemats are! They are skulls and they are holograms which means that look like they move sometimes. Eeek! Hope you kitties and doggies are all getting lots of treats this month! P.S. If you haven't seen yet, I'm having a giveaway for some fun peacock feather cat toys from NipandBones.com over on my Catster blog. Head on over and enter! Hi Cuteheads! Those of you following along for the past years know I started Santa Paws Drive, an online toy and treat drive to help send shelter pets a little holiday cheer each year. This is our third year! It's my favorite thing in the world. Our pets at home get presents, and the sweet kitties and doggies still waiting for their forever homes deserve a merry Christmas, too! Each year we choose six shelters all around the world, and everyone can donate toys and treats (or cash!) all online at SantaPawsDrive.com. We wanted to make it easy for everyone to donate, so all you do is buy the toys or treats or send a donation, we total everything up, split is six ways and send off HUGE gift packages to the lucky shelters pets! 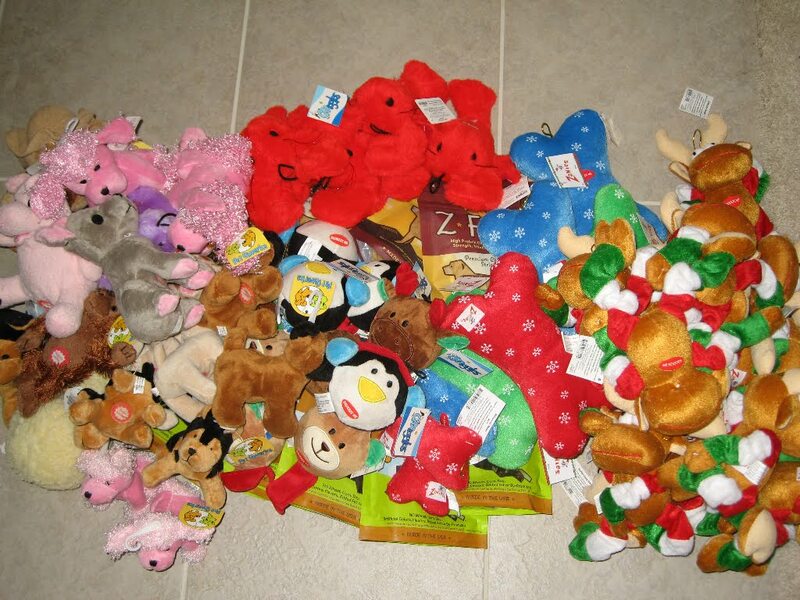 These are just A FEW of the toys each shelter got last year! 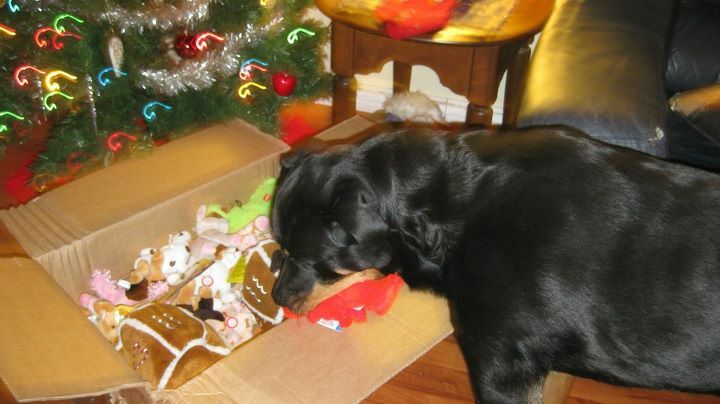 Hearing back from the shelters and getting pictures of the animals enjoying their presents is highlight of my year. It makes all the hard work worth it! 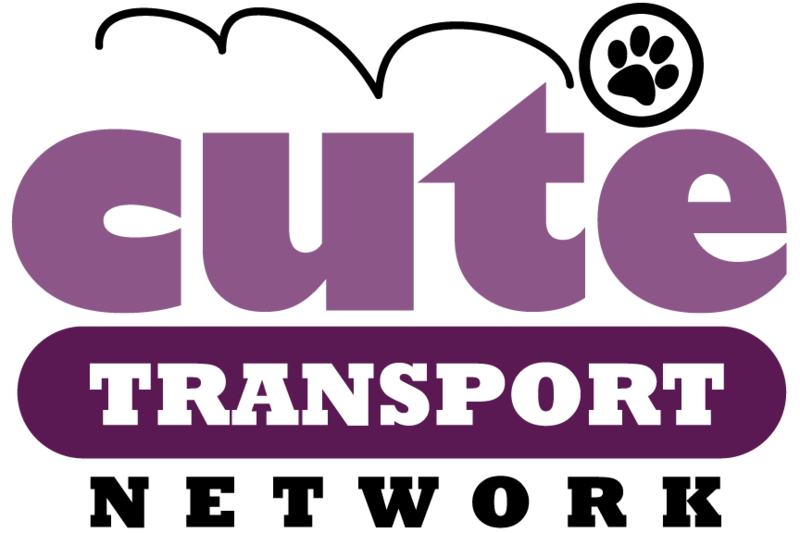 This year, we want to make Santa Paws Drive extra special, so we're going to focus on shelters and rescues that make an extra effort to help special needs pets. Think FIV+ kitties, black dogs, senior pets, handicapped cuties, those that need a little extra medical attention... any animal that might have a little bit of a harder time finding a forever home. They deserve the most special Christmas ever! If you have a favorite special needs shelter you'd like to nominate to be one of our six shelters this year, we are currently taking nominations. Up until October 21, you can fill out the nomination form and tell us why we should pick your special shelter! We'll officially launch the drive and start taking donations on November 1. We know there are some great organizations out there, and we're counting on you all to tell us all about them! 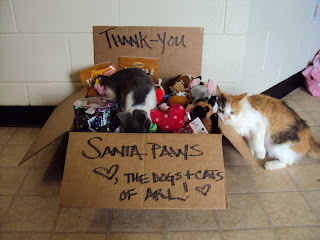 Want more info about Santa Paws Drive? --Read our About page to see how it all started. --See pictures of the packages we sent to shelters last year. --"Like" Santa Paws Drive on Facebook! Please share the word with all your animal-loving friends. We know there are many special needs shelters out there that we don't even know about, and many doggies and kitties that would love Santa Paws to visit them! The more people who know, the more Christmas cheer we can send their way! No one messes with The Dude. Especially when The Dude is a tiny chihuahua (That's really his name! Don't you love that?). Here The Dude demonstrates just how big he thinks he is against his sister, the giant 195-pound English mastiff. Maggie is sweet, but I'm still rooting for The Dude. I always like an underdog.